Is it just me or do World Expos never seem to be that big of a deal these days, until decades later when people think back to them? The Space Needle, the definitive mark on the Seattle skyline, was of course built for the 1962 World's Fair, a constant reminder as I look out the window. Or the great pavilions of the past that have become legends in their own right, such as this little pavilion that Walt Disney put together for the 1964 New York World's Fair, you might have heard of it... "It's a Small World." 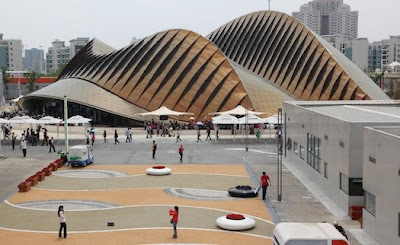 But the fairs keep going on every few years, and this year's Shanghai Expo 2010 is the largest ever, with over 5 square kilometers and dozens of pavilions. 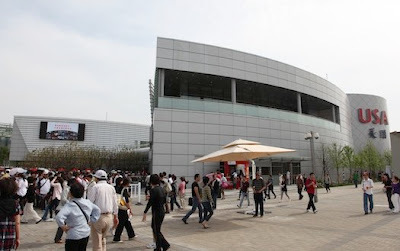 I've never been to an actual Expo while it was running, though who hasn't been to countless sites that once hosted a World's Fair. 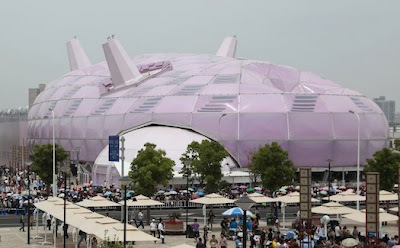 I have to admit, this year's fair in Shanghai, China really has me thinking it might be fun to take a trip out there before it closes on October 31st, 2010. Leave it to our Japanese friends to make it look like a giant Jigglypuff has passed out in the parking lot. Somehow I don't see this pavilion staying around after the Expo is over, but I could be wrong. Ah the great United States of America. 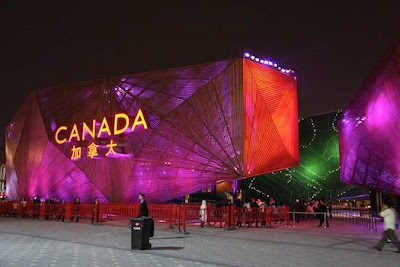 Land of endless innovation, countless modern marvels, and the most boring pavilion on the face of the Exposition. Where most nations use the World's Fair to pull out all the stops and do something awesome, bankrolled often by the government itself, we can thank our various fiscally-conservative laws for preventing nearly any public funding from going to its construction. That left American corporations to scrounge up a paltry $61 million dollars to put up this monstrosity. Consider however that the US failed to even participate in the last 2 Expos, this is a step up from that. If it's any consolation for the lack of creativity in the pavilion itself, you'll be happy to hear that it does feature both a Pizza Hut and a KFC. Fresh off of their highly successful run hosting the Vancouver 2010 Olympics, Canada still has plenty left to put together an incredibly awesome pavilion. When did Canada start showing us up all the time? Seriously? Can I just adopt Canada as my second country without actually going and living there?